Denver is experiencing a resurgence in their urban environment evident by the river paths, separated bike lanes and most beautifully in a hopping Union Station. 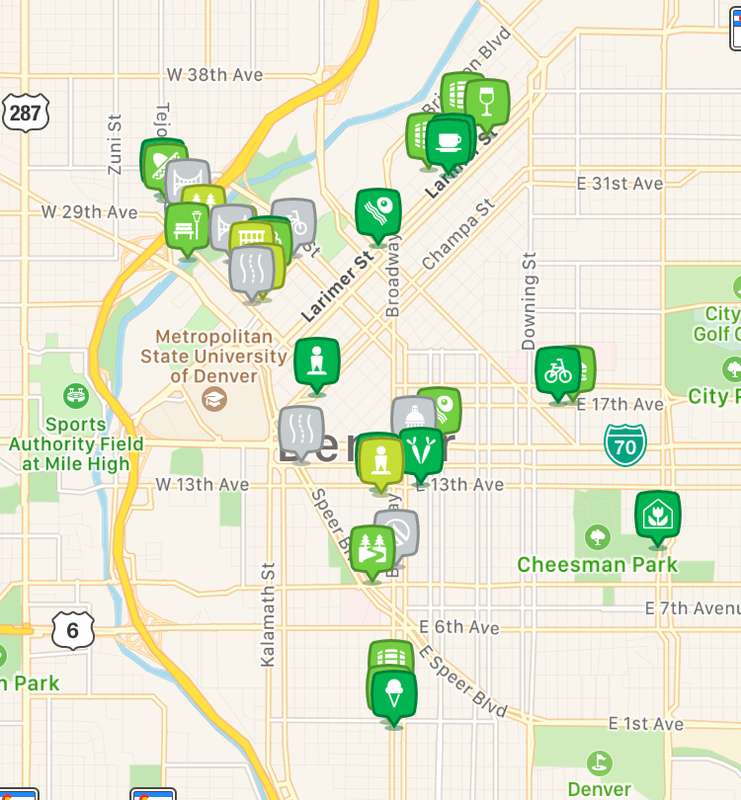 Our travel guide offers all the resources for you to plan your #WanderbyBike experience in Denver. Places for Bikes City Rating: 2.7 out of 5. Comprehensive and holistic rating on ridership, safety, network, reach and acceleration. Compare this score to Boulder's at 3.4. Walk Score: 61. Walk Score measures the walkability of any address based on the distance to nearby places and pedestrian friendliness. Transit Score: 47. Transit Score measures how well a location is served by public transit based on the distance and type of nearby transit lines. Bike Score: 71. Bike Score measures whether an area is good for biking based on bike lanes and trails, hills, road connectivity, and destinations. Denver Bike Map (PDF)- Pick up a free map at recreation centers. The short version is: “Go bike Denver.” If you have the time and the means, it is a fantastic place to see by bike, especially with kids. If you still require convincing, however, browse the images on this page and look at how many good places we were able to reach easily with an 8 year old who mostly rode her own (rented) bike. 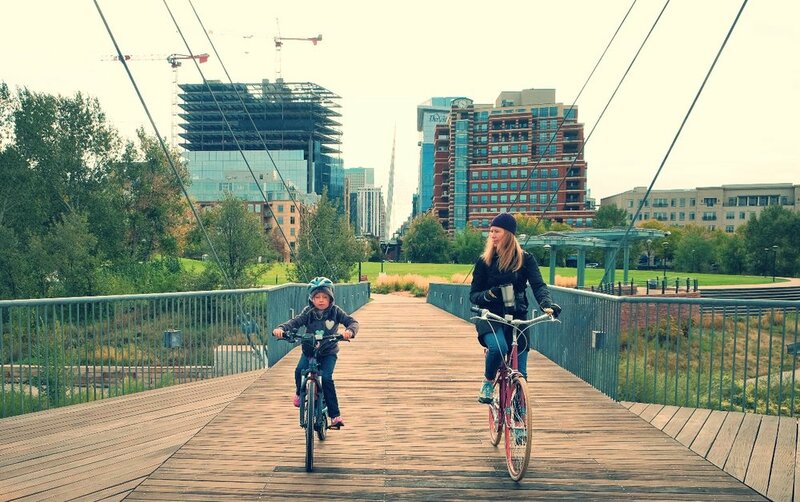 There’s no better testament to the bikability of any city than that--how much can your kid bike to? Denver checks tons of boxes on both sides of the crucial equation: they give you a lot of places worth going to see, and they give you first class infrastructure to get there without stress. They’re not done building yet, but they have more than enough now in 2018 to stand among the best North American bike cities, and their stated goals are all pointing in the right direction. Denver is already a “low heart rate” biking city, and it will only get better. If you have any mental associations of Denver as a mountainous city with huge hills, discard them immediately. Denver is remarkably flat, and easy to bike without sweating, even when the weather is warm. 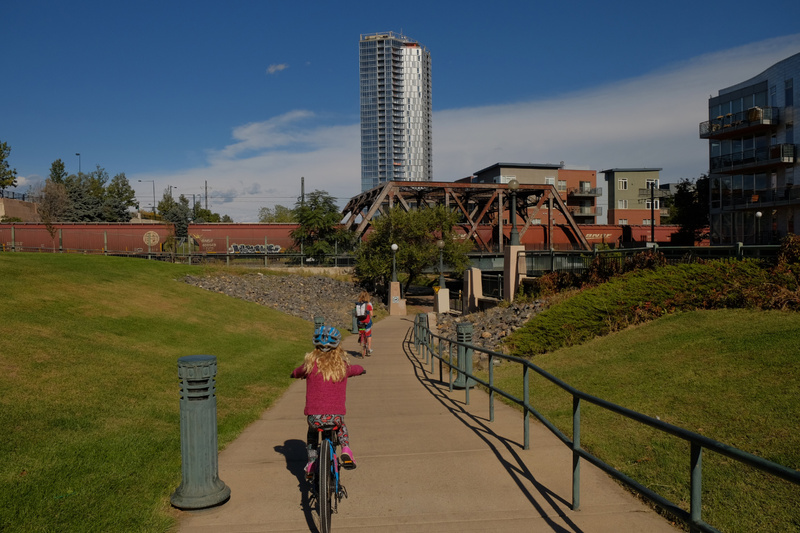 And the prettiest, easiest way to bike through a lot of town is the stunning Cherry Creek Trail, a very Minneapolis-like wide concrete bikeway with wayfinding signage that follows the Cherry Creek in town, eventually covering 40 miles out to the suburbs. 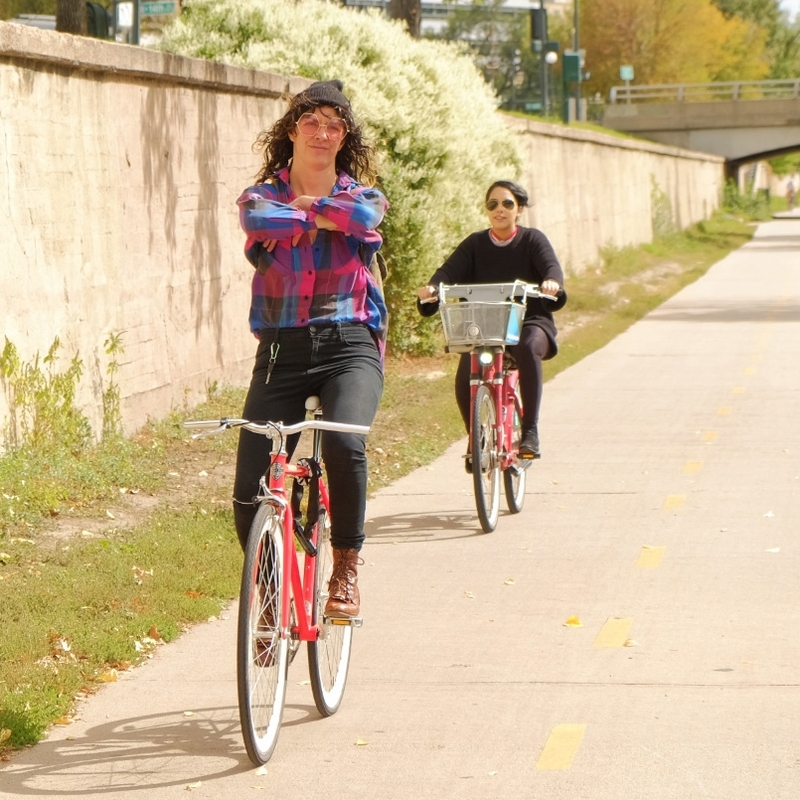 Urban biking doesn’t get better than bikeways like these, and Denver does its best to connect the other bike routes through town with it, making it so much easier to visit the world-class Denver Art Museum, the botanical gardens, Confluence Park, the Denver Zoo, and others. We especially enjoyed the River North (RiNO) district, with its huge murals and sprawling craft beverage operations, but then regular readers of this site probably know that where the breweries run thickest, the Bikabout rides quickest. Beyond the mere utility the Cherry Creek Trail provides as it shuttles you across town, it also provides you with a nice slice of local people-watching. You’ll see other tourists, locals running errands, and some of the more athletic riders, all out enjoying the trail. Given that you’re all biking next to a creek with flowers and art everywhere, and there are no cars in sight, everyone also tends to be in a great mood. This is what urban biking should be like, ideally. Denver has little or no habit of ringing bike bells to warn of passing another cyclist, and very little use of hand signals for turns. You’re unlikely to get a lecture from other cyclists for failing to do these things, though they remain a great idea in the interest of not surprising others. Shared use paths abound, but most separate the cyclists from the walkers via a strip of paint, so ride slowly when sharing space with pedestrians and expect the unexpected. Between sunset and sunrise, a front light and side & rear reflectors are required. We could find no helmet law. We would suggest bringing the bike inside at night if at all possible. And as always, a good quality U-lock does a much better job than a cheap cable lock. The bike scene has changed significantly since our last visit in 2015. No longer just road and mountain bikes, you'll now see cruising couples, dads on cargo bikes and lots of people saving themselves parking and traffic woes by using B-cycle to get to sporting events. The bike is now beyond recreation, which is a very healthy sign. 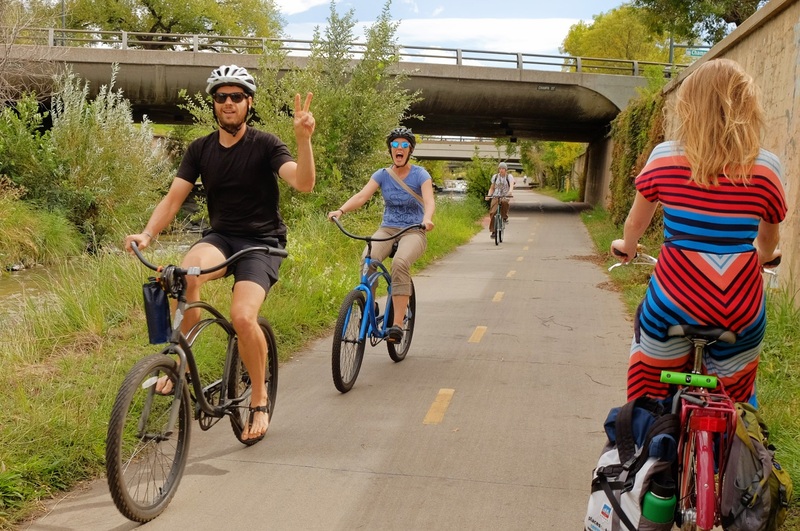 These routes were curated by local Denverites who wanted to share their #BestBikeRide with you. Print off the map for free! Ambassadors Needed! Live in Denver and love food, music, art or just being outdoors? Curate a route for us by inquiring here. evo Denver - $20+ daily for hybrid, cruiser, mountain, road, tandem or kid's bikes. Helmet and lock included in rental. 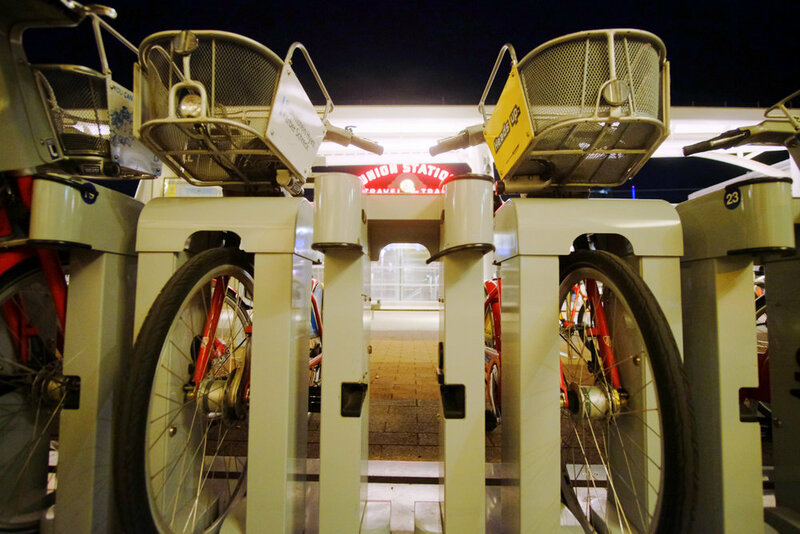 Pedego Electric Bikes - $50+/2hours or $80+/day for cruiser, commuter, interceptor or tandem bike. 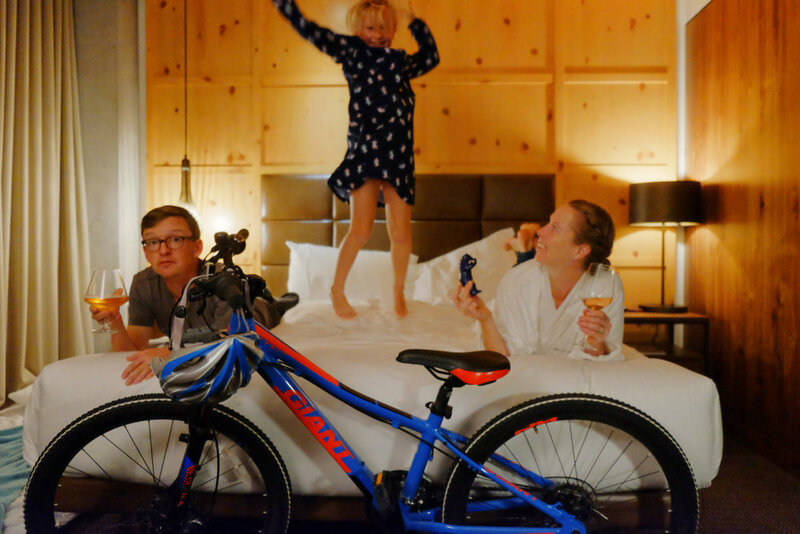 Slo Hi Coffee + Bikes - $36+ daily for City, Electric, Mountain or Road bikes. Small Planet Ebikes - call (303) 484-8518 for details. Bikes Together - Denver's non-profit bike shop. They host bike rodeos and camps for kids and fix-it tutorials for adults. Get $40 off your stay by clicking here. 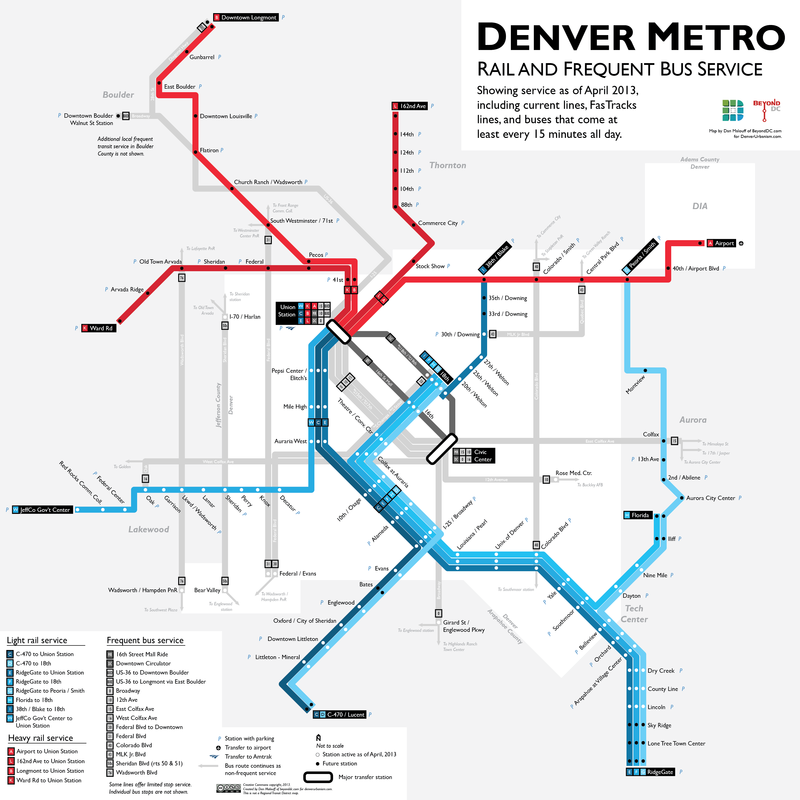 RTD (Map) - $2.60 for local, $9 to/from airport. 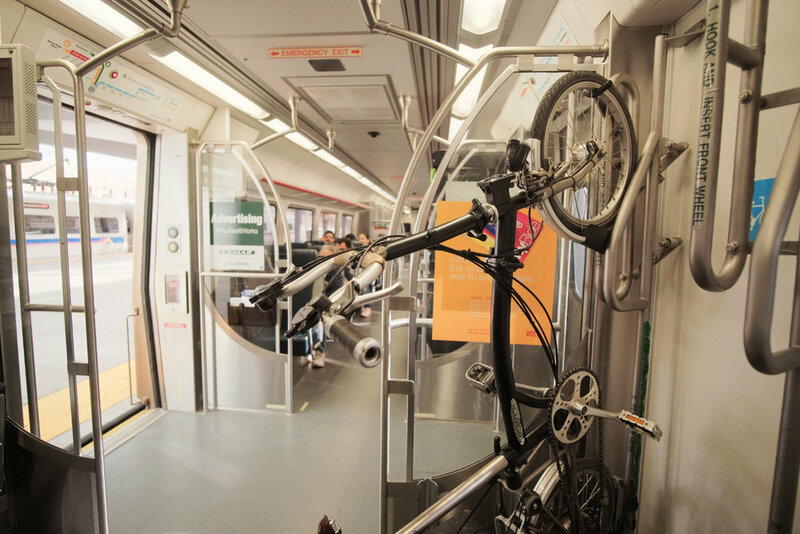 Bikes accommodated on light rail, commuter rail and buses on a space-available basis. Airport to Downtown - take A line to Union Station. Bikabout donates 25% of annual revenue to local advocates. You, too, can power better biking in Denver by donating to Bike Denver!